You’ve put hours on the practice board and now it’s time to get your game face on. 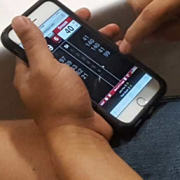 DartConnect’s Digital Steel keeps you focused on competing without worrying about scorekeeping, knowing what board to report to and all the little things that can kill your edge. Put DCTV on your mobile phone and stay prepared like a pro. Up to 5-Days Prior to a DartConnect Event, Check-In to add your name to the event’s player roster. See event organizer if you do not have an email address to use for check-in. After you’ve checked in, your name becomes available to register for individual events at the tournament. Tablets will be available to select the event you wish to enter. Note: Events with pre-registration may skip this step. After you’ve entered an event, visit the cashier for final confirmation and to submit payment. You will receive an email confirmation. Every time you’re assigned to a board, you will receive an email notification. Premium DartConnect Members can receive a text message instead by selecting that option in their account profile. Your friends and fans can sign up for FREE Fan Alerts and receive notification when you’re about to play with a link to the live DCTV scoreboard. Share this with your followers on social media! You can follow the entire event on DCTV with live scoreboards, leaderboards, brackets, board calls, results and more. Try it on your mobile phone and tell your friends! * Note: Steps 2-4 may not be available for all events. What happens when I check-in for DartConnect and why is it important? Use the “Event Check-In” link at the top of the page or Click Here. There is also links on DCTV and in the Tournament section of the app. Pro Tip: Help keep events running smoothly by checking-in a few days early, it takes less than a minute and can be done with your mobile phone. The check-in page will also highlight if an event is providing tablets for all boards and a list of players who have already checked-in. Announce your presence early and put fear in your rivals! Note: DartConnect check-in is entirely separate from event registration, you will still need to sign up for individual events and pay any fees at the tournament registration desk. Your phone just told you to report to your board. We made the next part easy for you too. 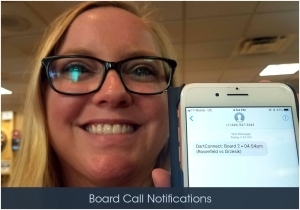 By default, everyone who has checked into a Digital Steel Pro event will receive board call notifications via email. If you are a Premium DartConnect Member, you can switch to Text Messages instead by updating your profile on the Member’s Website. When you approach the tablet on your board, enter the board # in the space provided and your match listing should appear with opponent’s names. The match format rules are pre-programmed, including the who starts and the # of legs. Download our complete Digital Steel Match Setup Guide for complete instructions. When the final leg is over, the red end of match screen will appear with the final score. You can choose to save the match by tapping the “Save Match” button, or the match will autosave after a 60 second countdown. Once the match is saved you can review the end of match summary and then tap the “New Match” button to reset the device for the next match on that board. If connected to WiFi, DCTV will update with the results, leaderboard will update and match reports will be emailed immediately. View Brackets to see every matchup and follow anyone’s path through the competition. Use “Find Player” in the menu to highlight someone. The Event Participants page will let you see if you or someone else has been registered for an event and if they’ve checked in. Use Free Fan Alerts to follow any DartConnect Premium Member (including all PDC Tour Card Holders) and get notified whenever they’re about to go live on DCTV. Share this with your own followers on social media. Work the tablet like an expert and speed through match setup. Once the match is saved you can review the end of match summary and then tap the “New Match” button to reset the device for the next match on that board. If connected to WiFi, DCTV will update with the results, leaderboards will update and match reports will be emailed immediately. For events that ask players to bring their own tablet, follow these tips and instructions for connecting your device to the WiFi network and logging into the tournament.